Glossing truly is just another phrase that we use versus a Toner, it’s a semi-permanent hair color either way, and in my experience I believe that the word Gloss sounds much more appealing to clients then Toner due to the stigma that toners have represented for decades in salons which meant /means ‘Fix it’. It can take the negative out of the automatic thinking clients do that something went wrong with their hair color. Also we need to rid some traditional salon color verbage such as, ‘your hair is fried, ‘I’ll slap some color on or you need a toner on your bleached hair etc. etc. all negitives, use ‘your hair is dehydrated, and ‘I will apply your color, "lets color gloss your hair, simple etiquettes yes! Glosses/Toners today offer much more than a fix-up, yes they offer the great ways to go a few shades darker add honey to the accidental white hi-lite and of course neutralize a raging orange/gold to the curb. And when it comes to getting that perfect color, there’s a fine line between “so right” and “not quite”. The benefits are also shine, condition and body without a fix-up involved and the word Gloss is a positive! And creatively I can use them as sheer drapes over satin hair colors, a wonderful tool when used right as well as marketed, practice using Gloss over Toner even when indeed it is a fix-up. Green hair can be treated with a red-based gloss to bring it back to a more natural shade. Yellow hair can be fixed by using a gloss with a violet base or by using a beige hair color. 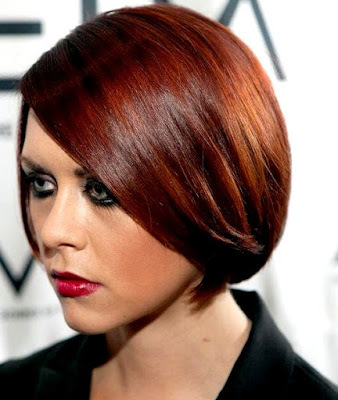 Red hair can be neutralized by a green or ash-based gloss. Blue hair will need an orange-based gloss to neutralize it.